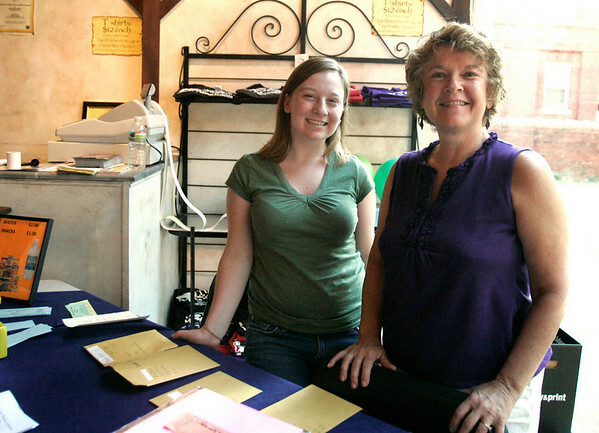 Salem: Sarah Jenness, left, and Donna Angelli greeted theatre-goers at the entrance to the Griffen Theatre on Lynde Street in Salem. Angelli is the mother of both directors who directed Friday night's plays. Photo by Mary Catherine Adams/Salem News. , Salem: Sarah Jenness, left, and Donna Angelli greeted theatre-goers at the entrance to the Griffen Theatre on Lynde Street in Salem. Angelli is the mother of both directors who directed Friday night's plays. Photo by Mary Catherine Adams/Salem News.